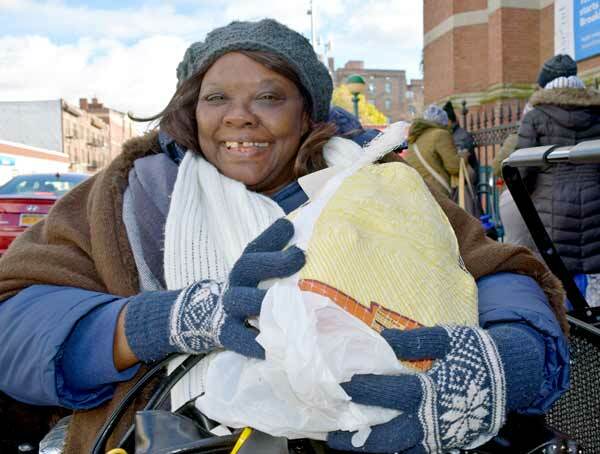 In less than 24 hours after the first snowstorm hit the New York City area, Linda Gayle Mathews sat in her mobile wheelchair outside St. Jerome’s parish in East Flatbush holding in her lap what seemed like pure joy wrapped in 12 pounds of cold, uncooked turkey. That’s because for Mathews, the smile on her face reflected the fact that for the first time in 54 years, she was going to celebrate Thanksgiving with her birth family. Mathews and hundreds of local residents felt the warmth and welcome, Nov. 16, as more than 800 donated turkeys were being distributed across Brooklyn and Queens as part of Catholic Charities’ annual distribution of turkeys and trimmings. In a one-week span, 400 donated turkeys were dispersed at St. Jerome’s, including 40 vouchers for a free turkey once the 400 items ran out that day, 300 turkeys at Resurrection Ascension, Rego Park, as well as 100 turkey to residents of Msgr. Thomas Campbell Apartments and Catherine M. Sheridan Center for Senior Citizens in Jackson Heights, according to the organization. At the Brooklyn parish, Catholic Charities’ staff and other volunteers that included local parishioners and students, were setting up shop. They were unloading and organizing boxes of fresh collard greens, squash, string beans, carrots and potatoes to bins of cranberry sauce, stuffing, corn muffin mix, gravy, garlic and sweet rolls that were spread among tables lined across the parish’s lower church. 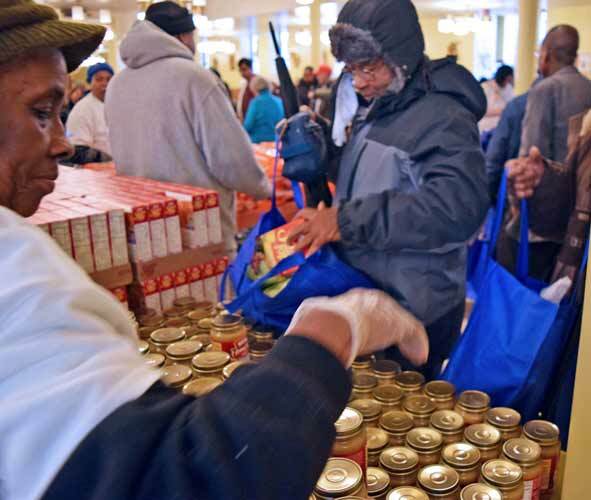 Logistically speaking, this year Catholic Charities partnered with parishes in Brooklyn in Queens to distribute the food items inside the churches instead of having the locals wait outside in the bitter cold. The idea to bring the community inside came from the organization’s chief executive officer, Msgr. Al LoPinto, after his experience from last year. Msgr. Alfred LoPino, CEO of Catholic Charities Brooklyn and Queens, helps a lady pack supplies into her wagon. As for St. Jerome’s pastor, Father Jean Yvon Pierre, he said it was a blessing that he could welcome people inside his church as one community. Being a part of a non-denominational church wasn’t going to be an excluding factor for Lakeisha Jordan and her family since for the last three years they participated in different programs Catholic Charities offers including the internship program for her teen daughter and sister. As part of the Relatives as Parents Program, Jordan not only raises her own three kids, with her youngest at nine months, but ever since her mother passed three years ago, she accepted the role of raising her 17-year-old sister – making the single mother of four grateful for what the organization does for her and her family. “I love it so much because it’s helping families and they really need it because we want to do Thanksgiving or cook dinner for our kids and sometimes it’s hard to do, but with Catholic Charities, they make it a little bit easier, no, a lot more easier,” she said as her infant Amaya lie asleep in her arms. But for the supermom waiting inside the church for her number to be called so she can approach the stocked tables, that day she was the recipient of goods. Yet, if it weren’t for her four-year-old son getting out of daycare early, she too would have been on the other side of the table sharing her time with the community. 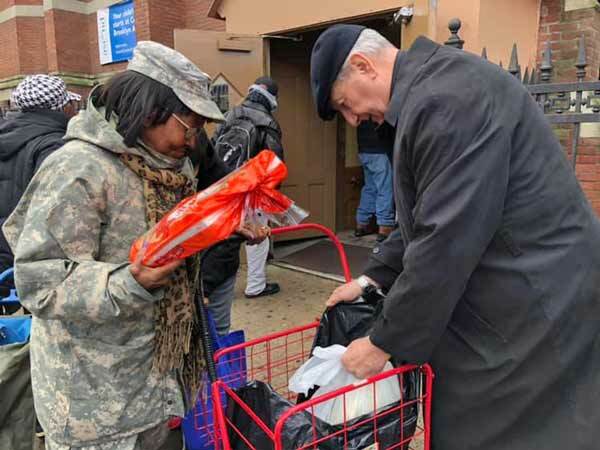 For the third year in a row, members of the family who helped donate hundreds of turkeys for the Thanksgiving event were on site during the Brooklyn and Queens’ parish distributions. Alphonse and Maria Catanese kept the charitable tradition alive in honor of both of their parents, who left an impact in their lives by living their faith through not only words, but also by action. Her hopes as a mother is that what her and her husband do for the community will inspire her children to also pay it forward. “It’s very important to me because it shows other people and our children to be generous and kind always,” she added. As the lines of people continued to wrap around the lower church throughout the morning and into the early afternoon, the assembly line of volunteers weren’t short of peppering in a “Happy Thanksgiving” or a “God bless you” to the faces that approached them. A little bit of organized chaos ensued, but the lines progressed and empty bags were filled one after another. Longtime volunteer and St. Jerome parishioner Theresa Obas was in charge of handing out garlic bulbs. She was directed to give only one bulb, but snuck in two every once in while when persistent requests would halt the line. For her, the bigger picture was evident.